Anoka, Minnesota – FABTECH Mexico 2015 begins at the Mate Precision Tooling exhibit at Booth 1527 in Monterrey, Mexico, May 5-7. See Mate's new CleanBend™ Press Brake Tooling, Thick Turret Roller Tooling and Laser Consumable Products. Utilizing rotating supports within the tooling, Mate's new CleanBend press brake tooling enables high quality sheet metal forming. CleanBend is designed for a wide range of applications, including: bending short flanges; bending a flange to a diagonal sharp or across existing holes; bending delicate or polished materials, including plastic coverings; and much more. Mate's press brake tooling also includes a full array of European Precision and Wila Trumpf style punches, dies, standard specials, specials and accessories, available in segmented, full-length and half-length sizes. Another first at Mate is its new Thick Turret Roller Solutions. Designed for high speed production of slits, ribs and offsets in a wide range of materials, Mate's Roller Solutions do the work with no burrs or nibble marks. Tooling speed equals the programmed table travel speed while creating curves, arcs and circles with the auto index station. Available now in thick turret B station size. Mate‘s innovative support for forming applications and special shape tooling can be previewed and discussed at the show with Mate's sales engineers. Expanding the capabilities of the turret with Special Assemblies from Mate Precision Tooling has never been easier. Mate Special Assemblies are designed with high performance features for forming card guides, embosses, threadforms, hinges, and are guaranteed to work right out of the box. For CO2 and Fiber laser system users, Mate continues as the industry's best single source. Products include high performance Peak, Black Magic™ and Performax CO2 lenses; fiber laser lenses, nozzles and mirrors; and CO2 laser nozzles and accessory products. Attending FABTECH Mexico 2015 and visiting with the Mate fabricating professionals provides new ways to work smarter, operate leaner and boost productivity. 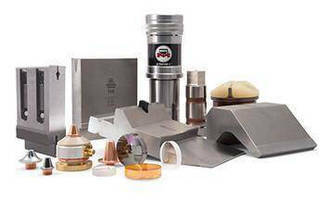 Mate is your one source for all punch press, press brake tooling and laser consumable products supported by sales engineers who have operated the same equipment used by their customers. See it all at FABTECH 2015 and the Mate Precision Tooling exhibit, Booth 1527 in Monterrey, Mexico, May 5-7.